The central feature of the Haveli is the assembly hall located behind the foyer. It is the focal point of the weekly assemblies as well as the religious festivals celebrated around the year at the Mandir. Spanning 50 metres by 45 metres (165 feet by 145 feet), and with no supporting columns, the hall can accommodate up to 2,500 people when fully opened. The main stage, stretching 28 metres (90 feet), is from where the regular sermons and programmes are delivered. With folding partitions, the hall can also be sectioned into two halves or a front half with two back quarters, each with independent lighting and audio-visual facilities as well as its own stage. Each of the four quadrants is carpeted in the Haveli’s bespoke broadloom, richly patterned and coloured with traditional Indian designs. Surrounding them is polished wooden flooring. Above, the ceiling comprises of four large lightwells, each surrounded by intricately carved wooden struts (angled supports) and patterned grills. In addition to these natural sources, light is also provided by specially designed suspended lanterns, characteristic of the classic Haveli genre but fitted with energy-saving bulbs. Also in the ceiling, a thermal heat exchanger conserves the thermal energy dissipated by the congregation and reuses it to heat other parts of the complex. Other furnishings and mouldings in the hall, such as the arched niches skirting around the upper walls, are also inspired by traditional Haveli architecture. 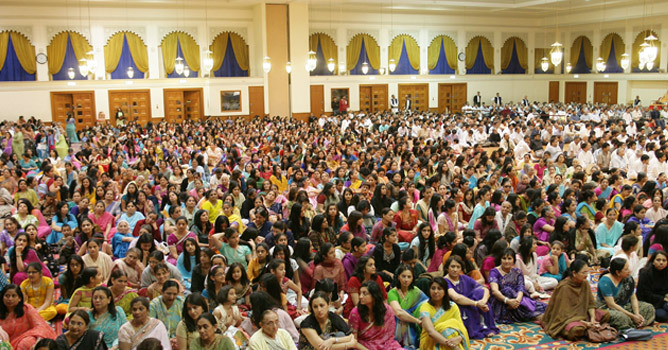 The assembly hall is where many of the presentations for schools and group visits take place, and is a hub of activity for the thousands of devotees who come to learn, worship and celebrate at the Mandir.